My mouth began watering as soon as i smelled this wine's bright lemon-zest-and-citrus-blossom nose. Great purity of fruit, with notes of quince, melon, and apricot. The wine is mineral-driven, with a pleasant light bitter/nutty note on the finish that adds dimension to the wine. A blend of Verdejo and Viura (85%/15%), fermented in stainless steel. Drink now through 2021. Pair with goat's cheese, lean dishes such as fish with lemon and capers or grilled chicken stuffed with lemon or limes. Also makes for a very refreshing aperitif! 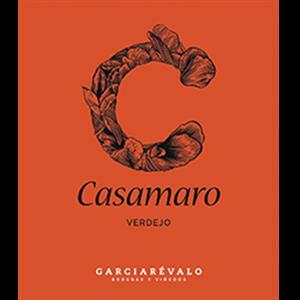 Since 1991 Garciarevalo has been a family-owned winery in the heart of Rueda (in Spain's North West quadrant). They specialize in Verdejo and also grow Viura (AKA Macabeo - the grape behind Spain's sparkling Cavas). The family grows 99 acres of vines, including some Verdejo vines that are over 130 years old. Their vineyards, at almost 3,000 feet above sea level, are also notable for sandy soils with traces of seashells. This is a unique soil structure among most of Rueda's vineyards, the sand allowing for excellent drainage and greater variation between day and night-time temperatures - ideal conditions for producing wines with the perfect balance of fruit, food-friendly levels of alcohol and mouth-watering acidity!